What Should U.S. Policy in Central Asia Be? Also a look at Kazakhstan’s developmental state of mind and its economic hurdles: recommended reads. Other good Kazakhstan reads: Make sure to first experience the sad, but useful, Oibai.kz (ойбай means “oh my” in Kazakh, as in “oh my god!”). The website just lists the current tenge exchange rates (dollars, euros, and rubles) as well as the oil price against a backdrop of grey government buildings and morose piano music. Then read the Reuters piece that explains why Kazakhs have few ways to speak out about their country’s economic plight. To further put some context to how Kazakhs are feeling and reacting to the tenge tumble, read Joanna Lillis reporting on the small protests that have been staged by people holding dollar mortgages. What Should U.S. Policy in Central Asia Be? Nate Schenkkan, the project director for Freedom House’s Nations in Transit wrote a response to last week’s Carnegie report on U.S. Central Asia policy that draws out many of the criticisms regional watchers had with the report. The Carnegie report, written by Eugene Rumer, Richard Sokolsky, and Paul Stronski, attempts iterate what U.S. regional policy should be. The trouble, however, is much of the report resembles what is already in place (also check out Navbahor Imarova’s interview with Stronski for VOA — I’m not sold on his argument that the report presents anything new and different but it’s worth hearing nonetheless). Schenkkan focuses on the report’s recommendation that the U.S. not condition security cooperation on human rights performance. He points out that the United States routinely circumvents the very mechanisms already in place which set human rights conditions on cooperation. “Now is not the time for the United States to double down on a dangerously shortsighted understanding of security,” Schenkkan writes. The paragraph was surprising for its even-keeled approach to the region, though it's doubtful Donald Trump will follow it. 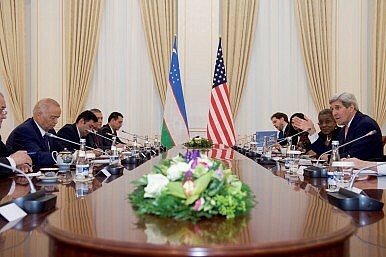 US Secretary of State to Visit All Five Central Asian StatesISIS Is a Concern but Not a Serious Threat to Central AsiaSettling the Caspian Issue and Realizing the Trans-Caspian Energy CorridorCentral Asian Central Banks Play with Rates to Boost GrowthWill the US Ever Get a New Central Asia Policy?